One of the most valuable skills a producer can bring to the table is the ability to maintain editorial integrity while helping sponsorship managers bring in revenue. Sometimes, standing firm on editorial considerations may cause tension between you and your sponsorship team. You may have felt things get tense when your sponsorship manager advocates for a client who envisions a straight forward sales pitch rather than a more integrative approach to demonstrating their industry expertise, or wants to speak on a topic that is outside of the scope of the event. Your job is to work with these sponsors and help them create a more integrative approach to demonstrating their industry expertise. Ideally, they will share their message in a way that fits seamlessly within the program parameters. A little tension is good in business as long as you remember that you’re on the same side. The key is to help sponsors understand how a quality program benefits everyone. Engage sponsors about the program early and often. Sponsors may have a ready made presentation that they want to bring to your conference. This may be OK, but often it needs to be adjusted to fit your program’s content and flow. Sponsors will respect you as the editorial leader – if you give them reason to do so. Demonstrate that you know your panels well, and that every speaker has a purpose in contributing to the narrative. This gives you credibility when suggesting time slots and presentation formats that differ from what they may originally have had in mind because they will understand your overall vision for the day. Business people respect quality. Leverage your sponsors’ expertise in building your program. Your sponsors are industry experts who are connected with hundreds of potential conference participants. They spend their days trying to better understand industry needs and how they can be of use. Their feedback is invaluable for creating cutting edge program content, and increased engagement will likely lead to a better experience on their end as well. Understand sponsors’ value proposition and who they are trying to meet. Understanding who your sponsorship base wants to meet will help you target relevant speakers and better engage your audience. It will also help you be a better host on site by introducing your guests to people who can help them. Ask speakers who their vendors are, and sponsors who their customers are. This will help you make sure you’ve canvassed the whole industry when inviting people to participate in your event. View yourself as an extension of sponsors’ marketing team. This means creating an event that is completely value focused for your audience. Both guests and sponsors will benefit from your taking a needs/solutions approach to conceiving your agenda. They are not signing up for a list of benefits, but rather becoming partners in the event’s overall message. 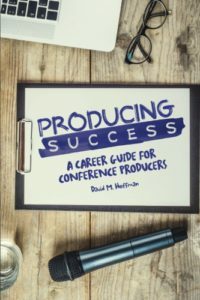 If you’d like to become an invaluable resource for your sponsorship sales team, read Producing Success: A Career Guide for Conference Producers – the only book written with your job role in mind. Pick up your copy today because you never know when the next sponsor will sign on!